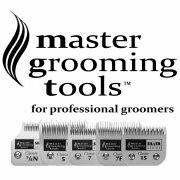 Our Master Grooming Tools Silver Series Clipper Blades are made using sp3 bonds for a high micro-hardness, high elastic ratio, and high electrical resistance. MGT blades cut better, reduce heat build up & last longer. The MGT Silver Series Blades were designed to fit all AGC & A5 style dog clippers, we hope you enjoy these great savings on the most popular blade sizes.